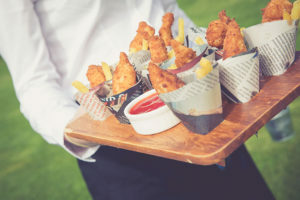 After all, they are sure to be a welcome addition to any wedding reception, a well-earned treat to hungry guests who may have skipped lunch or even breakfast to make it to your ceremony in time! Teamed with a celebratory glass of bubbles, a canapé (or two) can keep your wedding guests’ hunger at bay, ahead of a sumptuous wedding breakfast to follow. 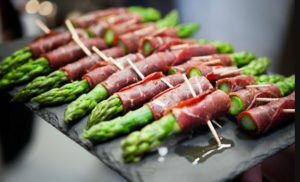 Here at Hudsons we have put together this guide to help you discover how best to choose and serve canapés at your wedding. 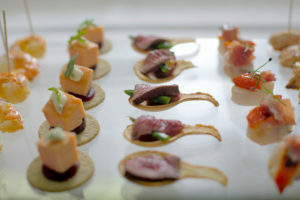 Canapés will most likely be the first thing your guests will have eaten since leaving home. Even more reason to make it delicately delicious and just enough to leave them excited for the main meal to shortly follow. 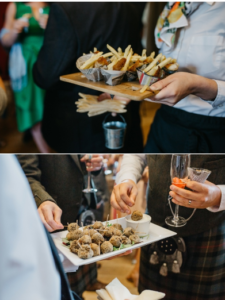 On the basis that your drinks reception is around the standard mark of two hours, a good rule of thumb here at Hudsons is 5 – 6 canapés per person. 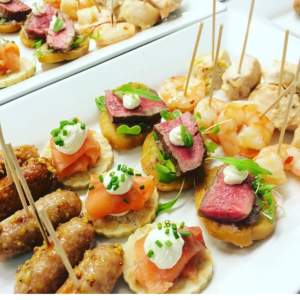 We feel that this is a great amount to whet your guest’s appetite and get them anticipating what tasty delights are to follow while of course offering something to soak up their celebratory drinks! A crowd-pleaser like our now famous Haggis Balls accompanied by a Whisky Dip or Mini Pancake of Pulled Pork, Smoked Salsa & Avocado should definitely feature, but if you are looking for something a little more delicate our Seared Scallop, Black Pudding & Pea Purée or Seared Beef Fillet on a Potato Scone with Béarnaise & Bay Sauce may be exactly what you are looking for. Two hours may feel like a long time when planning your post-ceremony reception, however, when surrounded by close family and friends you will find that this portion of your day will go by in a flash. Remember, there’s only two of you and as much as you’d love to spend every minute mingling with your guests, your drinks reception is also the time where you will get whisked away by your photographer for your first pictures as a newlywed couple. 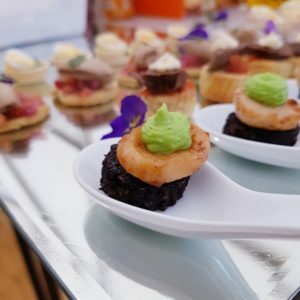 Below, we’ve listed a selection of sample wedding canapés that you could choose to serve at your post-ceremony drinks reception, but as with all our menus, the sky is truly the limit and we love to create personalised canapés! 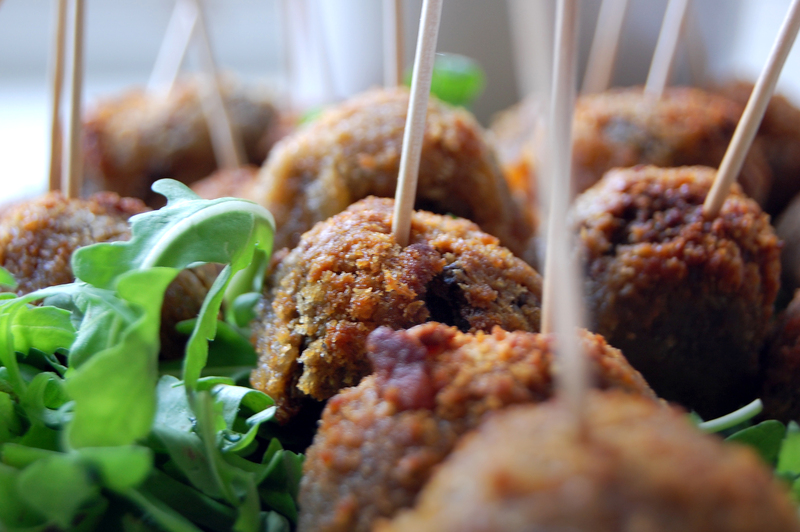 We also offer a large selection of vegan canapé options and can adapt our canapés to suit all dietary requirements.